Mestre Valmir, one of FICA Masters will be in London for the second time at 2012. It is a great pleausure to have him once again. He loves to share his commitment within Capoeira Angola also London has become a place he likes to come. I hope all Capoeiristas around are prepared for share and be challenged by him for the second time this year. Tuesday 20/11 - Roda at YMCA to celebrate the Black Consciousness from 7:30 to 10pm. 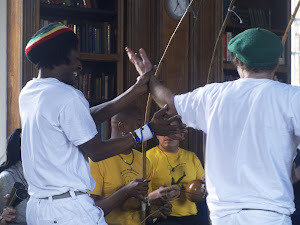 Sunday - 25/11 - Capoeira Musical instrument workshop (berimbau, vaqueta, caxixi), Lecture with Matthias Rohrig Assuncao (Universidade de Essex) "Zumbi dos Palmares - Myth and History , Roda at YMCA Stockwell - from 2pm to 8pm. Monday - 26/11 - Class at Capoeira South London - YMCA - Stockwell from 7:30 to 10:00. Tuesday - 27/11 - Brazilian food - Place and time to be announced.